So, the big launches have been made. While Google this week unveiled new Nexus devices, Apple, as many had expected, also launched the smaller version of the iPad, called the iPad mini. There'd been a lot of excitement over Apple's venture into the smaller tablet territory, especially considering that the late Steve Jobs was against tablets smaller than 10-inches. The Apple iPad mini, however, so far hasn't proven to be a threat to the current market leaders in the 7-inch tablet segment. A lot of people have dubbed the device overpriced for its size and specifications. As expected, there have been comparisons between Apple's iPad mini and Google's Nexus 7 tablet – a popular 7-incher in the global market. While the iPad mini comes with features such as Apple's A5 dual-core processor, the Nexus 7 slate features a quad-core processor. Also read, iPad Mini vs. Kindle Fire HD vs. Nexus 7, for an exhaustive specs comparison. The Nexus 7 32GB variant is priced at around $249 (around Rs. 13,500), whereas the iPad mini 16GB is available for $329 (roughly Rs. 17,800). By pricing the iPad mini higher than the Nexus 7 32GB (and far higher than the new Nexus 7 16GB at $199), Apple has made a clear statement that it's not eyeing the low-end segment. If one were to compare the specifications, it would be hard to vindicate Apple's pricing for the iPad mini. While on paper things might not be in Apple's favour, would consumers choose the iPad mini over the Nexus 7? 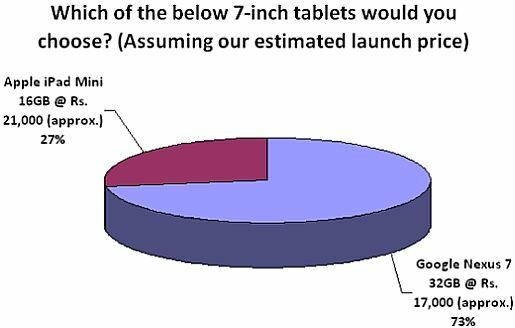 To ascertain what our readers felt about the issue, we asked our readers which of the two 7-inch tablets they would choose, in our weekly poll. 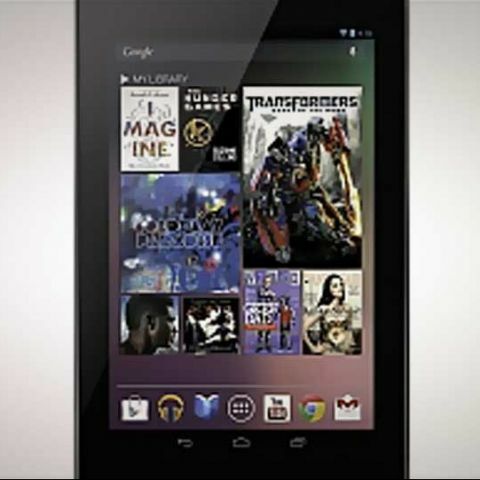 Readers were asked to choose between the Google Nexus 7 32GB @ Rs. 17,000 and Apple iPad Mini 16GB @ Rs. 21,000 (estimated launch prices at the time). We received a total of 656 votes, with the majority cast for the Nexus 7 32GB. As many as 478 respondents – 73 percent – said they would go for the Nexus 7, while only 178 respondents – 27 percent – chose the iPad mini. Seeing how popular Google's Android OS is in India, easily at par with Apple's iOS, it is evident that the choice came down to which device our readers felt offered the best value for their money. It would seem, that on paper, Google wins this battle. Actual sales however, will be the final word on the matter. Now, it's time for this week's poll question. This week we've asked you about Microsoft's latest OS, Windows 8, and if you plan to upgrade to it. In the meanwhile, check out our previous weekly poll results here.